A lighthearted look at those being regulated, financially. Here Comes the Fiscal Cliff. Risking it all to have “LUTCF” after your name. Let’s Look at Bernard Madoff’s BrokerCheck Report. Man Who Mocked the SEC in His Blog Has Been Indicted. Proposed Finra Rule May Offend Your Mother. Where’s Our Chinese Wall? Finra Wants to See it. Banker Removes Cash Directly From Client’s Wallet. The SEC Says BioChemics, Inc. Misrepresented its Collaborations with Cynosure and Unilever. Working Two Jobs Leads to Finra Sanctions. One-Eyed Murderer Forces Man to Commit Securities Fraud – A Halloween Special! Getting Rich from the Fiscal Cliff. I Stole a Bob’s Big Boy Statue in 1989, But I Won’t Steal Your Securities. FINRA Sanctions Research Analyst Who Wanted Only to Be Loved. Company With “No Employees, Office Space, Customers, or Products” was Bad Investment. Issuing Hundreds of False Account Statements is Not Okay, says CFTC. STRIPS Investor Stripped of His Investment, Dignity. Pretending to be a Hedge Fund Manager is Still Easy, Lucrative. Stock Manipulator Stiffs FINRA on $1 Million Fine. Not Our Problem, Says Federal Appeals Court. Was it the $5,000 Cowboy Boots? Nebraska Adviser Provides Investment Advice, Firearms. At the B&B Brothers Company Christmas Party! B&B Brothers Seeks Legal Help with its Fiscal Cliff Short. 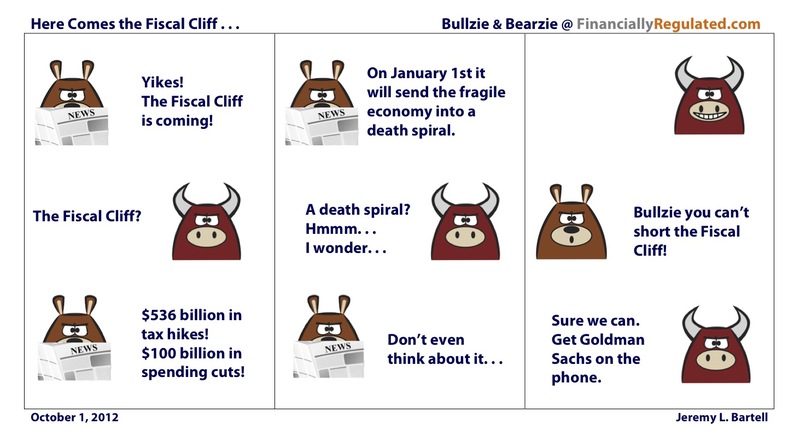 Bullzie Shorts the Fiscal Cliff. Meanwhile, at the High-Frequency Trading Firm. . . .